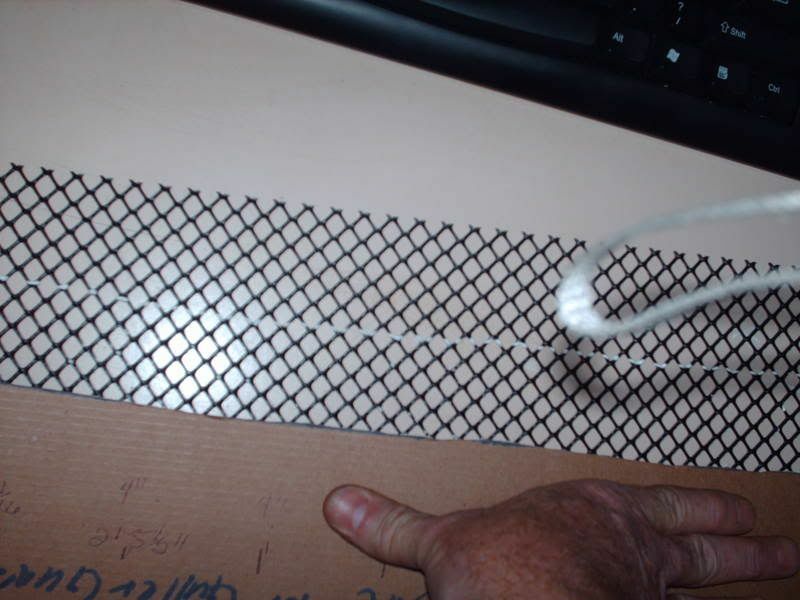 It is that time of year when leaves fill the rain tray plugging the drain holes with crap, well no more….. here are the Step by Steps to make your very own Vent Guard. 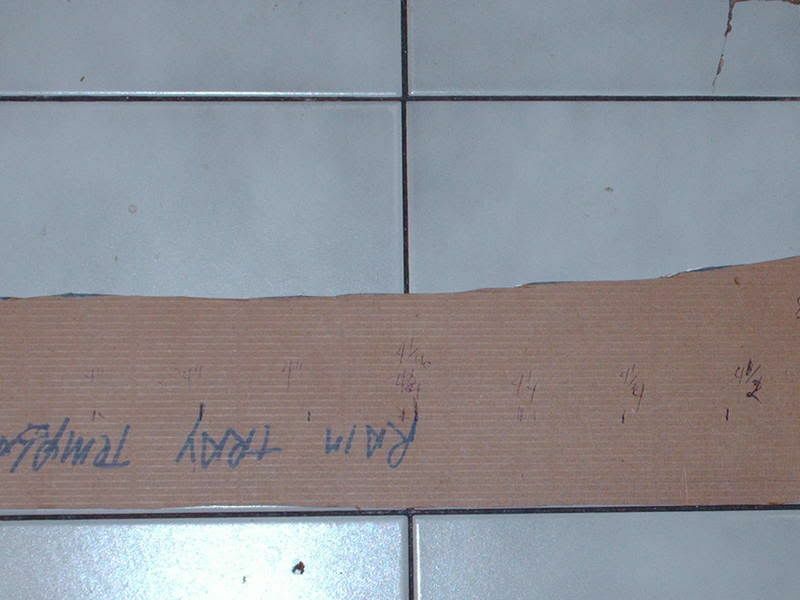 Take a piece of cardboard that is square 6 inches wide and 251/2 inches long. 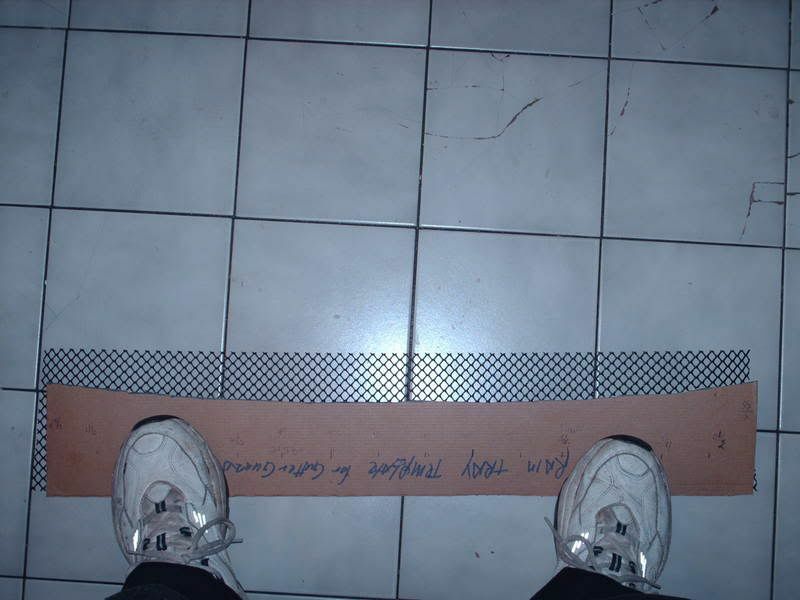 At the extreme edges of the cardboard measure up from the bottom 4 ¾” and place a tic mark. 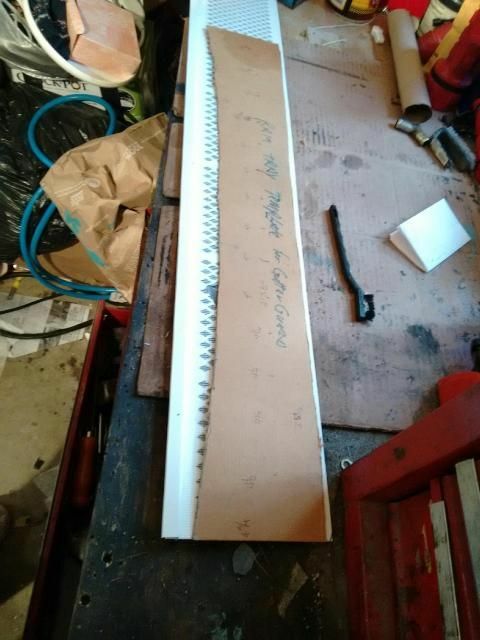 From the left of the cardboard measure off 2” lines down the length. From the Right side first tic measure up 4 ½” up from the bottom. The second tic from the right and left is 4 ¼” up from the bottom. The third tic from the right and left is the same 4 ¼” up from the bottom. Connect all the dots and you have an gentle arc that goes from 4 ¾” to 4” then back out to 4 ¾”. 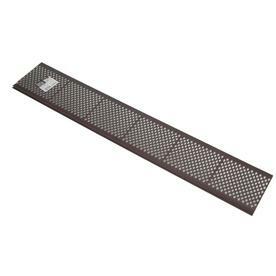 Now cut a piece of gutter guard that is 25 ½” long, Place it under the template. 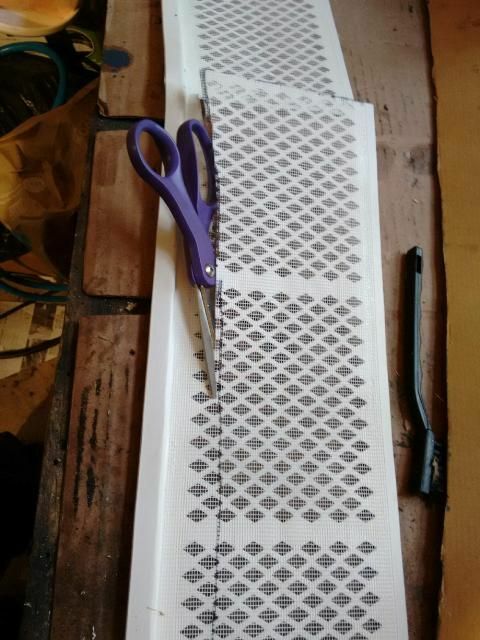 Draw a line to outline the template onto the guard. (I used white acrylic paint). 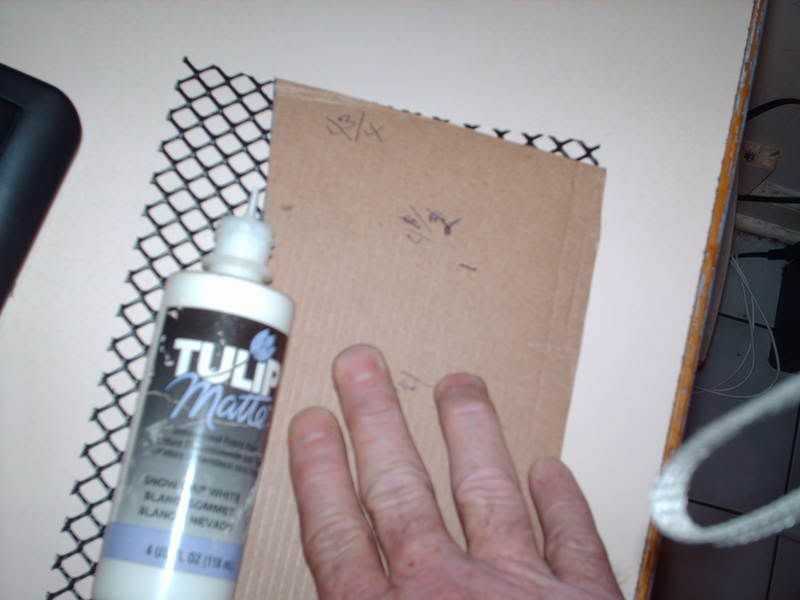 Cut out the gutter guard along your template line. Take a wire coat hanger, and make 4 lenghts of wire that are 5 inches long. 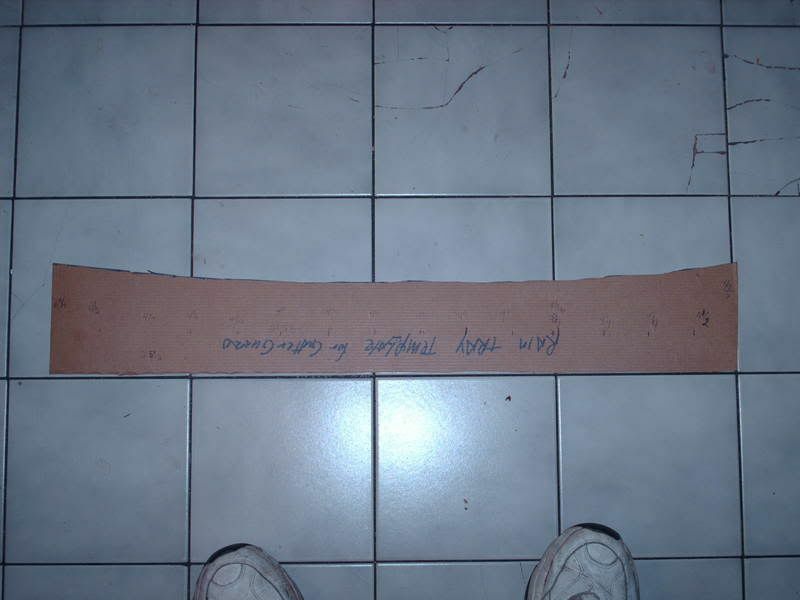 Make two bends in them so that the distance between the ends of the bends is 4 ¾” long. 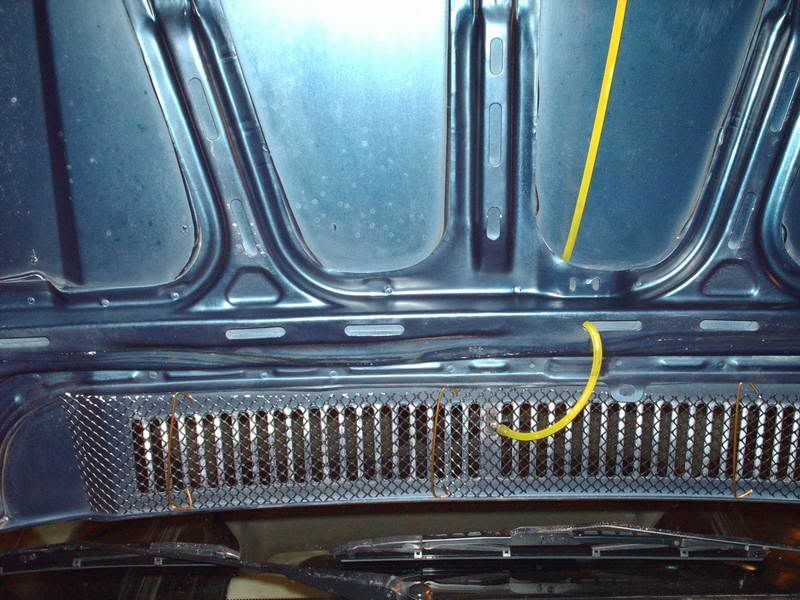 Take the hose off your windshield washer nozzle. Place the Vent Guard in to the trough and place the nozzle through one of the holes You may have to fidge it to the left or right a bit. 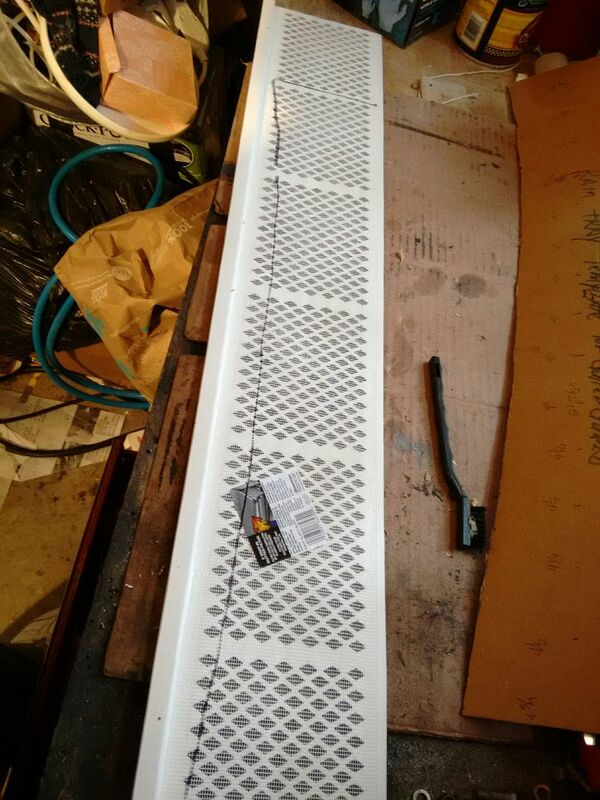 Now take your wire hangers and force them on the far edge of the tray into the top and bottom troughs and move them to the left or right to tighten them place the next one between the far edge and the nozzle. You can place them under one of the Vent Rails so that they won’t be seen from above. 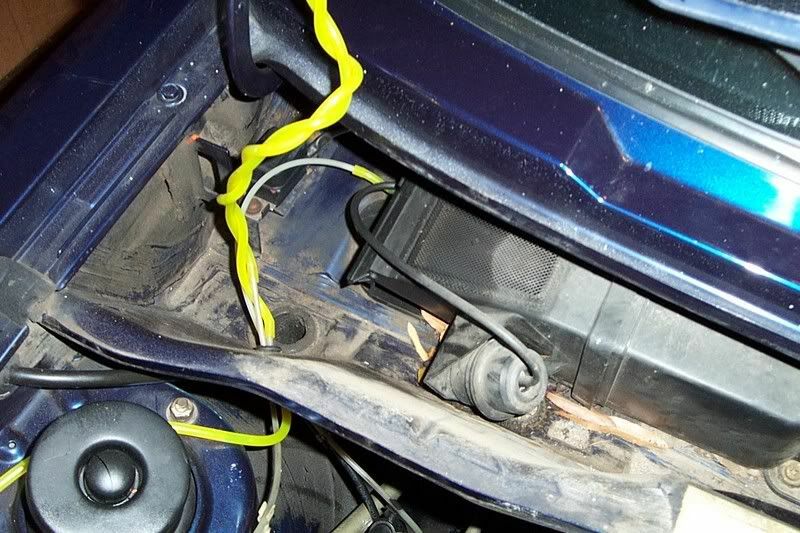 Reattach your Windshield washer hose to the nozzle. Thanks for the tip Brian, I believe I'll try this tip out as I have lots of leaves around here. Yet another example of the rocco's supiriority. Rocco's have these built in from the factory, lol. Just kidding folks. Rocco's arn't supirior, but they do already have the leaf guard. Great idea. 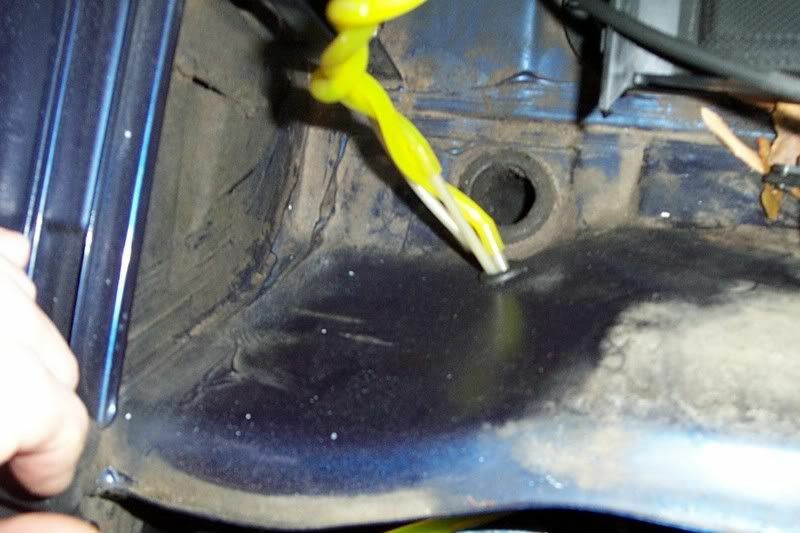 I vacuumed a metric buttload of leaf litter out of the rain tray area of my car. I get paranoid that that stuff will promote rust. 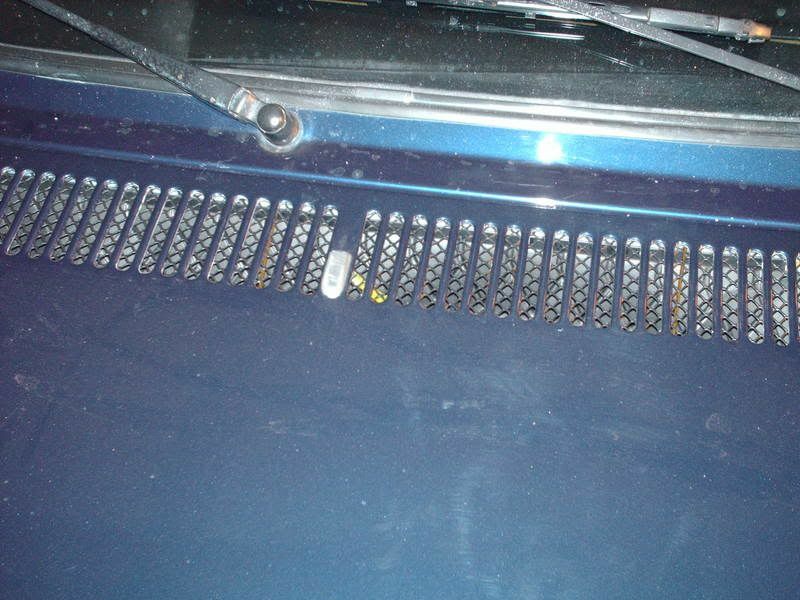 Mine also trapped a lot of pine needles in that space between the top of the trunk lid and the trunk lid seal. Hey Brian, let me ask a dumb question, where are the drain holes located, under the rain tray??? I looked the other day and I had water standing under the rain tray and it's rained every day since so I haven't had a change to check it out. Sure need to get the water out of there. I must have drain hole blockage where ever the drain holes are. Old Screaming Eagle wrote: Hey Brian, let me ask a dumb question, where are the drain holes located, under the rain tray??? I looked the other day and I had water standing under the rain tray and it's rained every day since so I haven't had a change to check it out. Sure need to get the water out of there. I must have drain hole blockage where ever the drain holes are. They ran windshield washer line through the middle of the rubber bbot and that is hte issue that it can cause crap to block it. 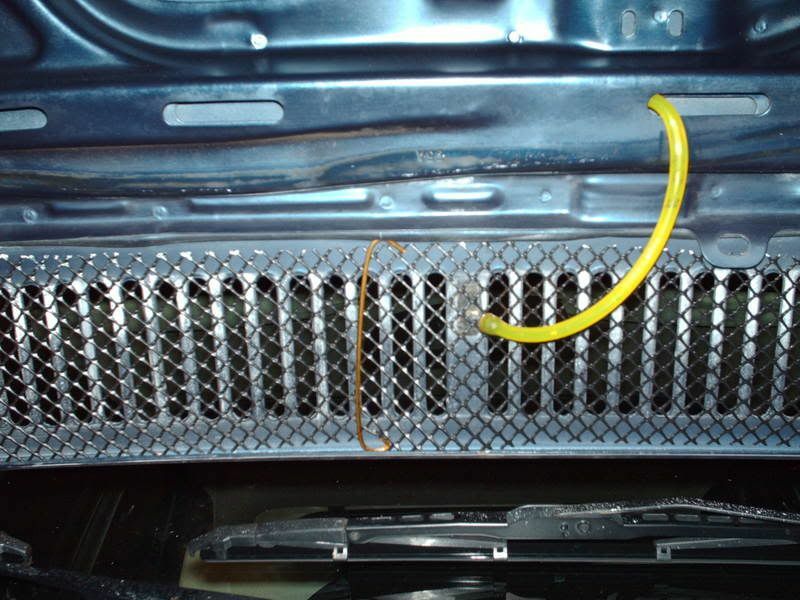 So when I re-ran my hoses I fed them throught the grommet that the vac lines go through with a small piece of hard vac line and forced the Windshield washer lines on either side. This helps to prevent the plugging of the feem throught. the right hand one is under the ECU on the 90's. Hey thanks Brian, I unstopped the drains today. The one on the passenger side wasn't stopped up but the drivers side had about two inches of water in it. Although you told me where the drain hole was on that side, I lack to have never found it. But I did with the help of some wire and just poking around. Now, no standing water. Thanks for the information pal. Got a better Idea for making a Debris Catcher. 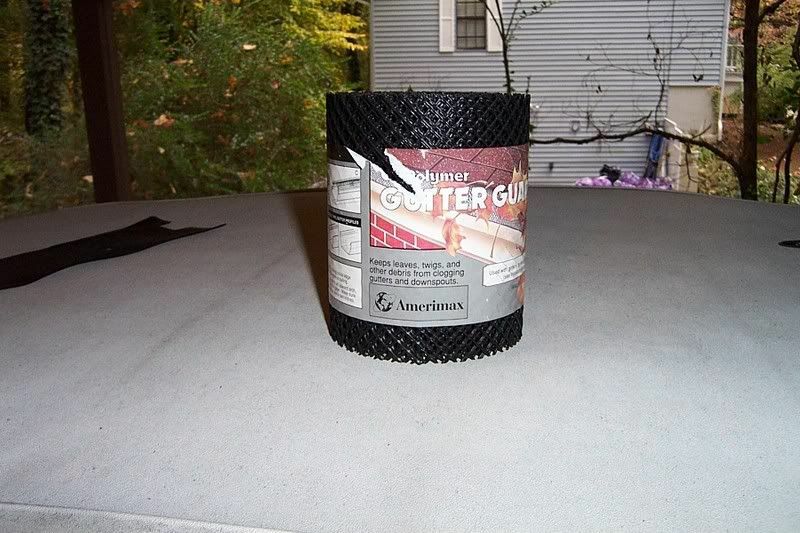 Go to the Home Improvement center of your choice and get a piece of Gutter guard, that is by Amerimax. It is Plastic and comes in white or brown. 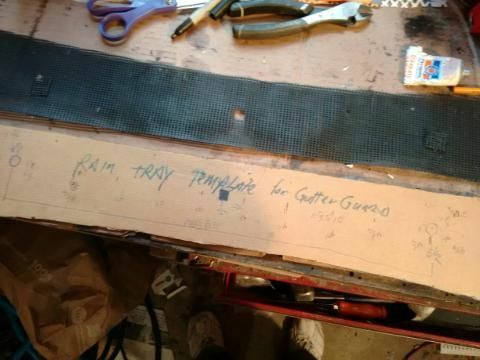 And transfer them to the Gutter guard, you want to make it a little wider possibly but this will work, catch fine and large crap, is easily cut with a razor knife, and if cut wide enough will hold itself in the hood catches, you and have to cut the large spline off of the one edge may have to trim it a bit around the glue on the frame but easily doable. Always looking out...for a better cheaper way. Template traced on to the Guard. Cutting out the shape, I am outside of the lines so I can trim to fit. Scissors worked well. One I took off a wrecked GTI years ago. 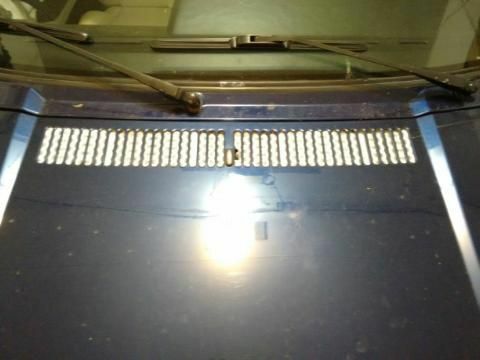 For a RABBIT HOOD with dual sprayers. From the left 5 inches over to the right and 1 3/4 inches from top edge a 1/2 diameter hole. From the Right 5 1/2 inches over to the left and 1 3/4 inches from top edge a 1/2 diameter hole. For a Cabriolet with Center Sprayers. From the Right Side 15 inches over and 1 5/8 inches from top edge a 1/2 inch square.